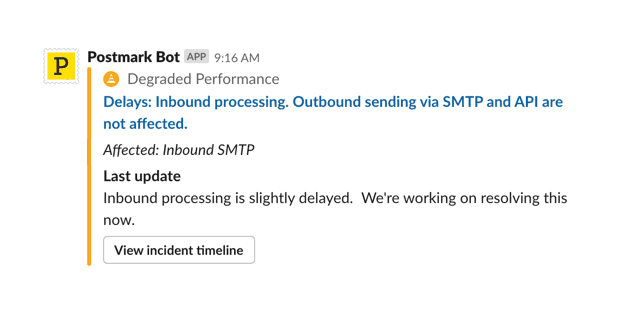 Keep on top of your transactional email by receiving bounce notifications, status updates, and more in Slack. 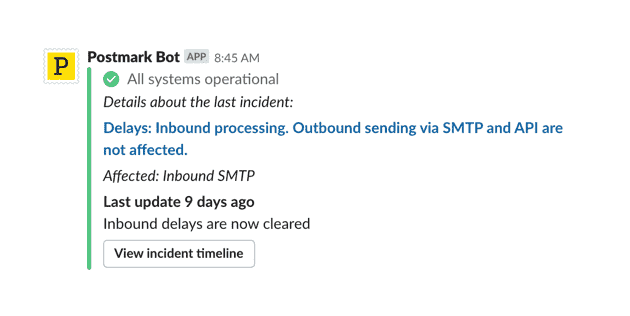 Get updates in your Slack channel whenever we add or update an incident on our status page. Send Bounce notification messages from Postmark to a Slack channel of your choice. The notification also provides a direct link to the Message Details page so that you can investigate further. Quickly access Postmark documentation and status updates using the /postmark command. Get the current Postmark service status. Toggle automatic status updates by specifying on or off after the status command. Get a link to the Postmark developer documentation.